Something that I haven’t done yet is recipes and I recently embarked on a baking adventure that I thought I would share with you all. Let’s first begin by saying that although I think I’m a somewhat half-decent cook but baking has never been something that I do with any regularity. A couple weeks ago though, the bee-eff and I, in our desires to warm ourselves up physically and spiritually (and get rid of my bunch of rotting bananas), decided it would be fun to make some banana bread. Bee-eff’s mother has a recipe (with modifications) that he likes so we started from there. Bananas (10 or something) – old from the freezer, or the ones that you dropped accidentally because you tried to carry too many Lean Cuisines in from the car at once. 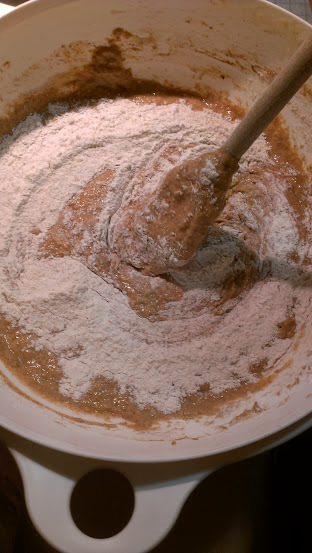 Flour (2 1/2 cups) – White or Whole wheat. Apparently, you can’t use Betty Crocker pizza dough mix. Who knew? Baking powder (4 teaspoons) – Or more, because apparently bee-eff’s mom likes it? Baking soda (1 teaspoon) – Or was this the thing that bee-effs mom likes? What’s the difference between baking powder and baking soda? Idgi. Apple Sauce (1 cuppish) – ‘Cause we aren’t Paula Deen, we don’t need butter. Milk (4 Tablespoons) – I used soy but you can use whatever. Eggs (4, or 8 egg whites) – Use this nifty trick to separate yolks from whites. Chocolate chips, cherry raisins or other yummy goodies. 2. Peel and slice bananas. Repeatedly put hands under warm water because the bananas are too cold to hold and lol this is Minnesota. Put in a bowl and allow to thaw or put in microwave if you are lazy. 3. Combine all dry ingredients (minus nuts and other goodies) in a bowl. Yell at bee eff when he doesn’t want to put sugar, cinnamon, or anything very delicious. Set aside. 4. Combine wet ingredients (including bananers) in another bowl. 5. Ask bee-eff if there’s an electric mixer. 6. Decide that a wooden spoon is good enough. 7. Add about half of the dry ingredients to the wet ingredients. Mix thoroughly. 8. Have your stirring technique criticized by both bee-eff and bee-eff’s mom. Allow them to take over. 9. Stir in the rest of the dry ingredients (sans nuts and goodies). 10. Look around the house for nuts. 11. Realize you don’t have any. 15. Find bee-eff’s sunflower seeds and figure that’s good enough. Toss in a few handfuls, fold in, and call that good. 16. Find some cherry raisins in the fridge and throw those in. 17. Bee-eff decides he wants chocolate chips (even though he didn’t want sugar?!?!) and throws those in. 18. Grease 3 (or whatever fits) bread pans. Pour batter in to each. 19. Place pans into the oven for 55-60 minutes. 11. Take pans out of the oven and place on wire rack to cool for 10 minutes. Remove bread from pans and cool thorougly on wire rack. Wrap in tinfoil and put in stove overnight before slicing. Say eff that. Take the pans out of the oven. Put outside in Minnesota winter for 5 minutes. Take bread out of pans. Eat with crunchy peanut butter.